One of the difficulties of identifying foreign silver is there is often a lack of coherent marks. Another big problem with checking foreign silver, is that even if there is a hallmark system, you are unlikely to be familiar with it. Despite this, it is a mistake to discount all foreign silver just because of your lack of knowledge, because in many cases foreign silver can have a very high silver content as well as holding great artistic or antique value. Foreign Silver often provides classic craftsmanship from some of the best silversmiths in the world. However a lot of foreign hallmarks do at least give you a clue about the quality of the silver and these clues help you decide on the content of silver from the high percentage metal to the plain white metal products. 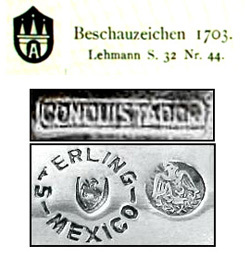 Understanding the marks on foreign silver is a specialised field. In part 1 of the quick guide to foreign silver hallmarks you can find the clues needed to find out about silver from abroad. You don’t have to be an expert in all foreign hallmarks to be able to identify the country of origin. Most foreign hallmarks give you plenty of clues plus some vital silver information that will help you sort the quality silver from the white metal. Please take a look at guide to foreign hallmarks Part 1 you can expect to find on silver from abroad. Is my Gold Gucci Watch a fake? How to Buy Silver and Gold. How to Sell Silver and Gold. 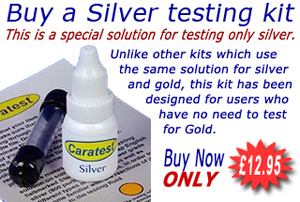 How to identify Silver and Gold. Buy a British Gold and Silver Hallmark Guide for your mobile device. How to Choose a jewellers loupe? How to identify real Silver from other Metals? Just what is a Carat? Why do we all suffer from Auction Fever? Got a Kindle? - Visit KindleFreeBooks. Where you don't have to spend a fortune to show you care!